When it comes to audio interfaces, Thunderbolt connectivity is currently the the fastest way on the market to transmits signals, lessening the possibility of latency issues. Although some engineers may not initially see how Thunderbolt is different from USB or Firewire, when you do your research, you’ll notice how Thunderbolt is unique. Good build quality of the chassis as well as components. 8 microphone/line channels with their own preamps. Near zero latency recording which makes it a proper tool. Might be an overkill for most users. Rack mounted audio interfaces are becoming the norm in most even in enthusiast recording studios. Fitting all the right features in this format has been the name of the game for quite some time. Fortunately for us, Universal Audio Apollo 8p comes already setup for serious use. If you need a solid piece of tech that works, this is it. What makes this model so attractive is the fact that it comes with 8 XLR/TRS plugs in the back. That’s plenty of channels all of which have their own dedicated preamps. 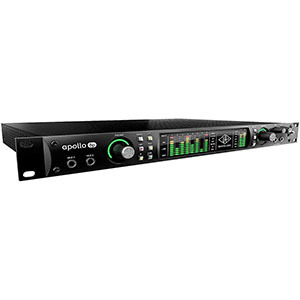 Apollo 8p also offers real time UAD processing which cuts any latency to more or less zero. That is just scratching the surface. This thing does much more. Very friendly layout that makes using this interface easy. Great selection of hardware suitable for professionals. High resolution recording allows for impressive quality. Based on an already successful model. Not the smoothest choice for Win 10 users. 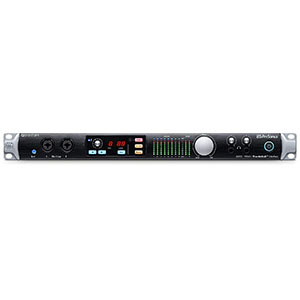 MOTU is one of those brands who have a long track record when it comes to audio interfaces. Their products are represented across all ranges, including enthusiast grade stuff as well as professional recording gear. MOTU 828es is a revamp of the older 828 which is a legend of its own. The refreshed version definitely adds to the preexisting platform. You’re looking at a Thunderbolt enabled package that comes with two microphone preamps, 28 inputs and 32 outputs. Front of the device is where you will find two main mic/line inputs as well as a color display. 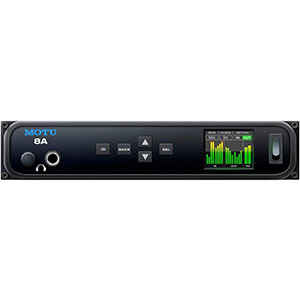 MOTU 828es is capable of recording in 24-bit/192 kHz resolution, which puts it up there with the best in the class. Some of the best preamps in this market segment. Comes with 18 inputs and 20 outputs. Great sound resolution with almost zero latency. Fits the standard rack mount profile. The control interface may be too simple for some. Focusrite is without a doubt one of the most popular names in the industry. With that said, most of their best known interfaces are from the enthusiast category. That doesn’t mean that Focusrite isn’t capable of designing and creating a rack mounted interface which packs a whole lot of heat at a reasonable price. Fosucrite Claret 8Pre fits that description. As you can probably tell by its name, this bad boy packs 8 dedicated mic preamps. On top of that, you are getting 18 inputs as well as 20 outputs. The overall performance is pretty good with great resolution for the price. Best of all, the whole interface is pretty simple to use thanks to a very clean control interface. 26 inputs and 32 outputs make it a game changer. Great resolution with very little latency involved. Comes with a decent selection of software. Lacks a bit in number of dedicated mic preamps. PreSonus is right up there with the most popular brands in the business when it comes to audio interfaces. As a matter of fact, it is among the best three. Many will say that most of that popularity comes from their lower end models, however that really doesn’t change the fact that awesome models such as PreSonus Quantum 26×32 exist. What defines this particular interface are its numerous inputs and outputs. 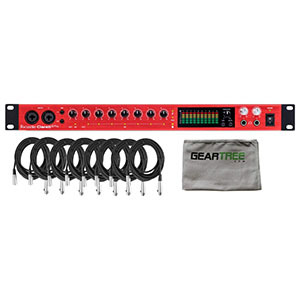 This is a perfect choice for those who need to connect a multitude of mics or instruments to their interface. With a 24-bit/192 kHz resolution, it is easily among the best sounding rack mounted models on the market currently. Quantum is very easy to use and quite intuitive. Compact design which easily fits on a desktop. Clean control layout that is simple to use and friendly. Comes packed with a 8 instrument lines. Great resolution and sound quality right out of the box. The lack of mic support is compensated with ESS Sabre32TM DAC technology which allows you to tap into analog levels of audio quality. The actual resolution is the standard 24-bit/192 kHz which is more or less the minimum for Thunderbolt enabled interfaces. Needless to say, the latency is borderline non existent with 1.9 ms for the round trip. Minimalist and simple design which works great. A tight but functional array of inputs and outputs. Super low latency combined with good sound resolution. Features software that is perfectly optimized for MacOS. Feels like to could have been more functional. Simple on the outside, Apogee ELEMENT 24 is quite an impressive package on the inside. Apogee is a brand that is specialized in designing interfaces and gear optimized for use with Macs and Apple products in general. That is why ELEMENT 24 comes across as so weird. It is all about exploiting what Macs do best. Overall it works well. This box comes with 10 inputs and 12 outputs when you count every single port. You are getting high resolution audio in a box that yields 1.41 ms round trip latency. What really makes it a good choice for Mac users is the software alone. They have optimized the software in a way which flows perfectly with the MacOS. One of the most iconic interface designs out there. Great set of microphone preamps. Comes packed with a whole lot of features. Great build quality which inspires confidence. Not the most optimal bang for the buck solution. When Focusrite first hit the market with their portable audio interfaces, it didn’t take them long to start dominating the industry. Since Thunderbolt is more or less the future of this technology, it was only logical to remake their most popular models in a way which uses it. 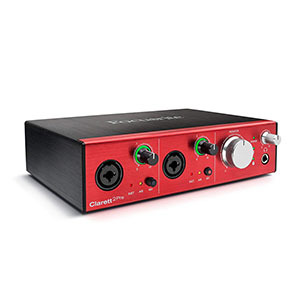 Focusrite Clarett 2Pre represents exactly that and it is quite awesome overall. The whole thing is focused around the two Clarett mic preamps which pack a whole lot of gain but also offer plenty of headroom for instruments. The sound resolution is quite impressive, with 24-bit/192 kHz being the standard across the range. As expected, Focusrite ships these with a whole lot of cool software that makes the entire experience great. An enthusiast oriented interface that works great. Comes with two pretty great preamps built into it. Hi-Z switches designed to handle hot electric guitars. Plenty of functionality in an affordable package. Doesn't offer too many features. 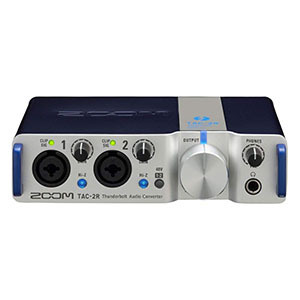 Although their main gig used to be guitar processors, Zoom also makes some of the best audio interfaces on the market. A model we were really interested in is the Zoom TAC-2R. This is one of the very rare audio interfaces which utilize Thunderbolt tech while being fairly affordable all things considered. On top of that, it is quite good. Zoom has designed this interfaces for home users which is also why they were able to cut down the cost so much. Most users won’t need anything more than two inputs and two outputs. You are getting low latency, great preamps and an overly practical design. If you need something simple, efficinet that works, this is easily your best bet. A very simple and mission focused design. Great preamps which deliver an awesome sound quality. Four analog channels which work with both mics and instruments. Very little latency make it a great tool for beginners. Compatibility issues with newer MacOS versions. Resident Audio is a brand that offers something that is quite rare on the market. We’re looking at a 4 channel interface with four dedicated mic inputs and analog preamps. What really makes Resident Audio T4 impressive is the fact that it’s priced very competitively compared to most other models on the market. It doesn’t really get better than this. Truth be told, this interface isn’t the most feature packed thing out there. However, it really doesn’t need to be. The fact that it packs 5 dedicated channels linked to a Thunderbolt tunnel makes it awesome. Everything that comes on top of that is just an extra. If you’re on a budget and need something that works, this is it. 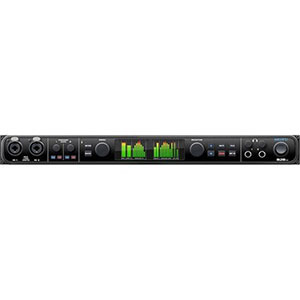 Why are Thunderbolt audio interfaces special? There are essentially three big reasons Thunderbolt interfaces might be a better option than some other audio interfaces that use USB or Firewire. Those reasons are low latency, reliability, and affordability. As I’ve already mentioned, Thunderbolt is the fastest external connection out of those three options. This means it has the lowest latency — in other words, it has super low to no delay during recording and playback. For example, it takes 4.5 milliseconds round-trip for a signal to travel through a USB connection. That seems pretty fast — until you contrast that with how fast a Thunderbolt signal travels. With Thunderbolt, it takes 1 millisecond — that’s faster than it takes sound to travel from the beat of a kick drum to the drummer’s ear. Not surprisingly, Apple and Intel created Thunderbolt connectivity, and since then, they’ve closely guarded the protocol for the creating and implementing of these devices. Because of this, it makes compatibility less of a hassle because you know every single Thunderbolt device is just as compatible with your computer as the next one. You can be assured a Thunderbolt-ready audio interface will be compatible with a computer that accepts Thunderbolt connectivity — in fact, it’s guaranteed. (Also note: you’ll need to make sure the interface’s software is compatible with the computer’s operating system). Dealing with two pieces of equipment that aren’t friendly with each other is like being the middleman in an argument between two enemies — stressful, frustrating, and pointless. Plus, you’ll be able to rely on the aforementioned super speed of the signal transmission. Don’t underestimate the importance of an interface with low latency — it can make a world of difference. And you can rely on a Thunderbolt interface to change your world. You’d think an audio interface with the fastest type of connection would be super expensive — the most expensive types of interfaces on the market. Well, that thought would be incorrect. Thunderbolt interfaces are actually pretty affordable — you can find a decent one in the $600 range or even less. For example, you can find the Focusrite Clarett 2Pre in the $500 range, and it’s difficult to go wrong with a name like Focusrite. 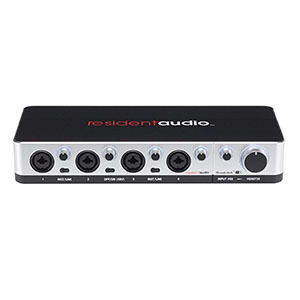 Also, you can usually find the Resident Audio T4 audio interface at an even cheaper price. So the stereotype that Thunderbolt audio interfaces are just for the richer or more experienced engineers. You can find a good fit for you, regardless of your budget or experience level. Using a Thunderbolt audio interface is probably your best option, but of course it depends on your needs, preferences, and recording setup. But Thunderbolt connectivity will give you faster signaling and lower latencies, it will be reliable and have guaranteed compatibility with a Thunderbolt-ready computer, and you’ll get great quality for what you’ll pay. Whether recording at home, on the go, or in a professional studio, it would be smart to consider grabbing a Thunderbolt interface. Trust me, you won’t regret it, especially when you hear the final product.